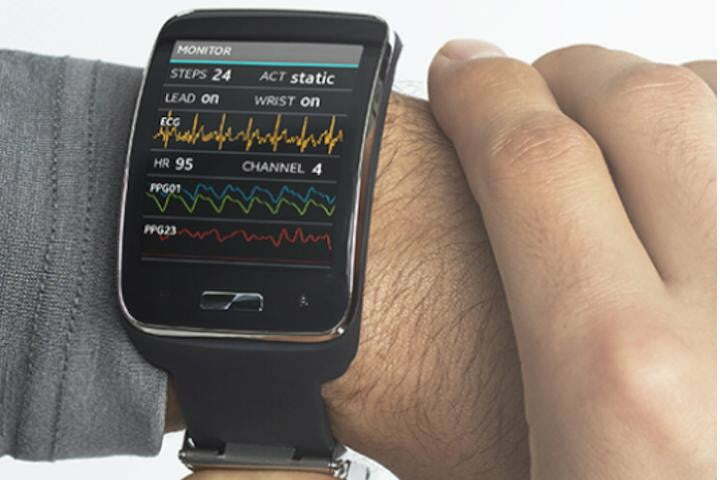 Samsung has uncovered the Simband, the result of several months development following the announcement of its health-focused SAMI platform back in May, when the wearable was only seen as a concept. The wristband has been redesigned, and it’s based on Samsung’s Gear S smartwatch, only loaded with extra sensors for monitoring many different aspects of your health. Sensors are dotted around the strap, and include the now expected heart rate sensor and accelerometer, plus sensors to take the temperature of skin, blood pressure, and even how much sweat your body is producing. The six sensors are modular, and developers can swap them out for alternatives. Data collected by this sensor array is displayed on the large touchscreen, along with the date and time, plus a few cool new features. The first is a dashboard, where information collected on blood pressure, a step count, and your heart rate is shown, along with a comparison to stats taken over the past week. The Simband can activate all its sensors at once, and show a real-time feed of how your body is functioning, while a “spot check” gives a 20-second overview of the same stats, and compares them to the last quick check the device performed. The Simband and the cloud-based SAMI platform to which it will be connected are key to this philosophy. Data is supposed to be shared with healthcare professionals, who can then create personalized diet, fitness, and health plans. However, it’s still not quite ready for general sale. The Simband demonstrated is a development unit, but Samsung has now opened the device up to developers, and produced a software development kit with a set of APIs to incorporate existing software into the system.